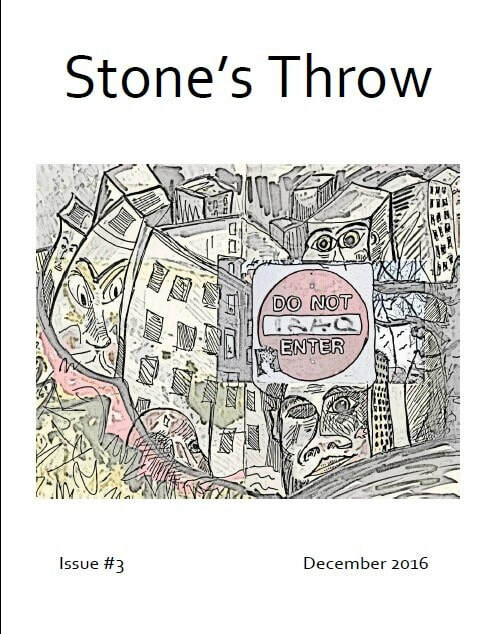 I decided to come out with Stone's Throw, a regular zine comprised of contributors from the crowds of Stone Soup Poetry and Oddball Magazine. After nearly a year of immersion in web publishing with Oddball, doing this back-to-basics, three-stapled, one-sided-copies approach seemed like the perfect thing to do. Still, I want to make sure the work I select gets seen by as many people as possible, so I will be offering each issue as a PDF file as well. For each issue of Stone's Throw, poets will be chosen and invited to contribute poems that either relate (however closely or loosely) to each issue's selected theme. “I Keep on Going, Guess I’ll Never Know Why.” Front and back cover art by Adric Giles. Featuring poets Elizabeth Hanson, Deta Galloway, Zachary Bos, Abagail Petersen, Liza Zayas, Melissa Silva, Laurel Lambert, Rene Schwiesow and Ron Goba. “The Marathon Must Go On." Front and back cover art by Whiskey Radish. Featuring poets Stephanie Kaylor, Russell Bennetts, Bridget Eileen, Dexter Roberts, Luis Lazaro Tijerina and Ron Goba. "The Democracy Benefit Issue." Sporting a great cover by Adric Giles. Featuring poets Mark Lipman, Gladys Teresa Hidalgo, Dexter Roberts and Donna Woods. "Change as Scorched Earth." Dedicated to the late James Conant, my friend and artistic collaborator of over a decade whose work is featured on both the front and back cover. Featuring poets Mignon Ariel King, Ryk McIntyre, Susan Deer Cloud, Tony Brown and Ron Goba. "The Ferguson Issue." A dramatic and effective cover by Adric Giles. Featuring poets secret genius, Navah the Buddaphliii, Rachel Copans (who also contributes photography), Jason Wright, D. Ruff, Margie Shaheed, Chad Parenteau, DiDi Delgado, Andrew Borne, Radiant Jasmin and Toni Bee. "Desperation." Featuring a cover photograph courtesy of James Conant. Featuring poetry by (in order of appearance) Chad Parenteau, Lee Varon, Scarlett Pedersen, Jason Wright. Muriel Soule, Martha Boss, Dexter Roberts, Andrew Borne, Toni Bee Laurel Lambert and David P. Miller. Capped off with wonderful artwork from Labor Day, 1977 by ﻿James Van Looy.